The Slave Queen, Death’s Mistress. Nicci has gone by many names and faced many challenges. ‘and the sorceress must save the world’. 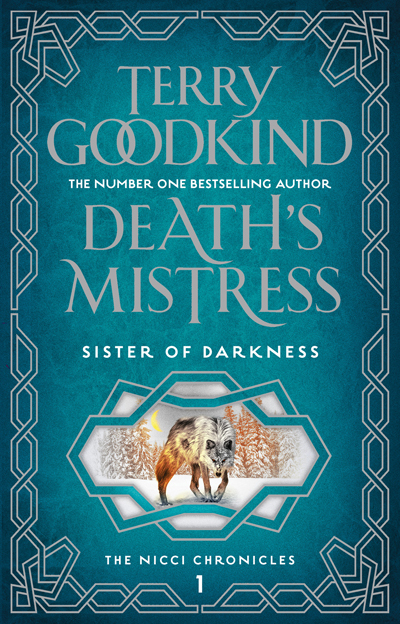 Terry Goodkind was born and raised in Omaha, Nebraska, where he also attended art school, one of his many interests on the way to becoming a writer. Besides a career in wildlife art, he has been a cabinet maker, violin maker, and he has done restoration work on rare and exotic artifacts from around the world – each with its own story to tell, he says. In 1983 Goodkind moved to the forested mountains he loves. There, in the woods near the ocean, he built the house where he and his wife, Jeri, live, and came at last to tell his own stories.